There is a huge folklore in many cultures regarding the beneficial effects of garlic. 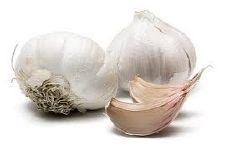 It is claimed that garlic purifies the blood and so ensures a better circulation, helps with the moult by stimulating the fall of down feathers, and whilst not being a cure is claimed to stunt the growth of internal worms. It is also something you can make for yourself at home, as follows. Chop four garlic cloves and place into a sealable container (or old milk bottle and seal with cling film or foil). Pour into it a pint of boiled and still hot but not boiling water, seal the top and leave to stand overnight. This mixture is then added to one gallon of drinking water and fed to the birds. This mixture should be given to the birds once a week. The postive effects will not be immediate but will accumulate over time. I found a better use for Victoria`s slow cooker, keeping the little guys alive.The heat can be set accurately and is regular, set on low, with the time switch on for 15 minutes then off for 20. Less heat needed as they grow and get bigger, padded out with a nest-felt. 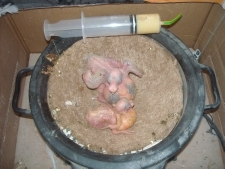 Hand feeding before work then at tea time, a third feed at lunchtime would be better but time won`t allow. Just a stop-gap untill a pair of feeders becomes available. Picture showing two chicks at different ages but with this system age doesn`t really matter. I use a 50ml syringe with a piece of electric cable attached (wire core pulled out), with Versele-Laga Nutribird A19 or A21 hand feeding mix. P.S I had to buy Vic a new cooker, for some reason she didn`t want to use this one again.